John Wiley & Sons, 1988, 326 pages. Satellite Monitoring of the Earth is a synopsis of state-of-the-art use of satellite technology for monitoring the earth. It is also designed to be an introduction to satellite remote sensing by covering in a multidisciplinary approach the different applications of remote sensing. Following a brief overview of the technology in the first chapter, the book examines the different platforms (satellites) and selected sensors which have been flown to date. 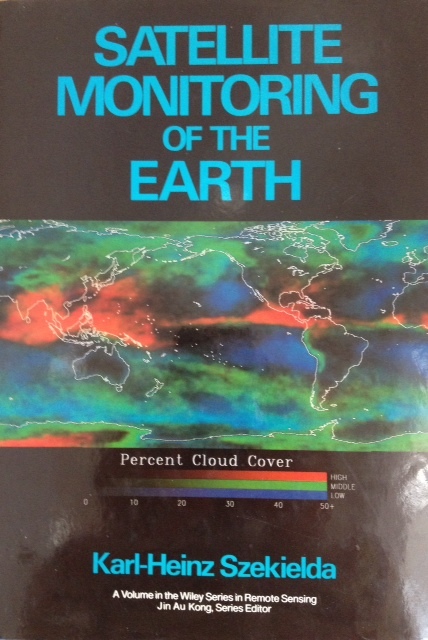 In this context, Chapter 3 discusses atmospheric considerations to demonstrate the problems encountered in the use of satellite observations. Chapter 4 provides a detailed description of the spectral signatures of objects to clarify the interpretative data referred to throughout the book. Chapter 5 outlines concepts in data interpretation. Chapter 6 "Observations over the Oceans" takes into account phenomena which can be observed with recent satellite technology and presents selected case studies which enhance the data presentation. Chapter 7 "Observations Over the Continents" lists and describes ﻿geological features﻿, as well as water on the continents, and vegetation. Complete with numerous satellite images, figures, tables and a comprehensive bibliography. It is as an introduction to remote sensing and serves as a reference for research and management personnel involved in satellite monitoring and remote sensing, as well as anyone with special interest in these fields. Future Security: 7th Security Research Conference, Future Security, 2012, Bonn, Germany edited by Nils Aschenbruck, Peter Martini, Michael Meier, Jens Tölle, ISBN 3642331610. RF and Microwave Wireless Systems by Kai Cheng. John Wiley & Sons, 2000.